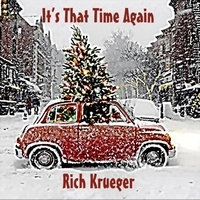 "It's The Time Again" is a rootsy and soulful new Christmas track from the award winning singer-songwriter, Rich Krueger. This digital single is available now in advance of the January release of his upcoming full-length album, Life Aint That Long. Born in Bedford-Stuyesant Brooklyn, Rich Krueger has been writing and performing, solo and with his band The Dysfunctionells, largely in Chicago and NYC, since 1985. The Dysfunctionells, featured on WXRT, PBS-Melbourne, and WFMT, among other stations, since the 1990’s, have backed up the Holy Modal Rounders at their reunion at The Bottom Line in NYC, and have recorded with Peter Stampfel of the HMRs. In 2018, Rich is releasing two full length as-yet-untitled studio albums, featuring many great musicians from Chicago, Tulsa, Pennsylvania, and NYC. The first of these two records is “Life Aint That Long”, to be released January 26, 2018. One this CD is a bonus track “It’s That Time Again”, a song for the Christmas Season, and perhaps even more for after the season. That song and another digital single from the album “A Stoopid Broken Heart” will be released digitially on November 20th and will be available at www.richkrueger.com, CDBaby, iTunes, Amazon, and Spotify. "’It’s That Time Again’ is one of the earliest songs I wrote. It was inspired by a recollection of a memory of going to church for the midnight Christmas Eve service at our families church, and the snow coming down burying the parked cars. I have no idea why a seven year old would left outside on his own in a snow storm at 11 pm on Christmas, but hey it was simpler times. FYI In 2017 Rich was chosen as one of the Kerrville Folk Festival New Folk Finalists. These songwriters were chosen over 600 wonderful entries we received from North America, Europe, Australia and Japan. Rich didn’t win, just like many of the previous luminaries that have been in New Folk, such as Lyle Lovett, Nanci Griffith, Shawn Colvin, Steve Earle, and Lucinda Williams, and others who had never even gotten into New Folk, like Michelle Shocked. There are literally tens of rabid Rich Krueger fans scattered all over the globe...poor sods all.